NintenGen: *Speculation* Command & Conquer 3 coming to Wii? 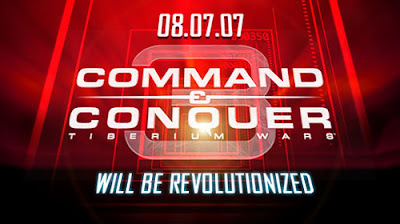 *Speculation* Command & Conquer 3 coming to Wii? "Our 1UP spies used our patented brand of trickery to get a hold of the mysterious teaser image pictured above, which has been circulating in the e-mails of Electronic Arts employees involved with the recently released Command & Conquer 3: Tiberium Wars. So what does it all mean? The only thing we know for sure is that some C&C3-related announcement will be hitting EA's official site for the game on August 7th. The image is also appearing on the site now. The news could be anything from a new expansion or game announcement to a patch release to -- hell, maybe it's just a website redesign. Whatever's going down, we'll be there to catch it in a couple of weeks." An interview with EA a couple of months ago revealed that they were interested in the idea of bringing C&C3 to the Wii. This announcement that C&C3 will revolutionized on August 7th this year only seems to add more fuel to that fire. In my opinion, the only real way to revolutionize C&C would be to bring it to the Wii. Porting the game to the PS3 or adding an expansion pack would be far from a revolution and EA knows full well that the Wii has been a revolution both in code name and in actually changing the way we play games. If the announcement is anything other than a Wii version, I will be very disappointed in EA to say the least.